After the reform of the academic curricula favored by the Austrian Empress Maria Theresa who personally directed it, in 1771 the Faculty of Philosophy of Pavia University was assigned the chairs of Geometry, Elemental Algebra, General Physics, Sublime Algebra, Mechanics and Experimental Physics. In 1778 Alessandro Volta began to teach in Pavia. Indeed, in the year 1786, an “Avviso del Regio Imperiale Consiglio di Governo” (i.e. a note from the royal imperial assembly of government) decrees that “essendo la Regia Università di Pavia il centro della Istruzione Nazionale (… )debbano fare I loro studi a Pavia anche que’ giovani che vogliono esercitare la professione d’Ingegnere o Architetto” (being the royal university of Pavia the centre of the national instruction (.. ) also, those young that want to practice the profession of Engineer or architect, must study in Pavia), and it decrees that nobody may practice the profession until he has “riportato il grado della licenza nell’università” (achieved the degree in the university). Class Schedule, University of Pavia, a.y. 1804-05. 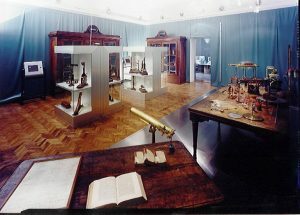 ARCHIVIO DI STATO DI PAVIA, Università, Reg. 805. Photo of Fiorenzo Cantalupi. The existence of several mathematical subjects led quickly to the definition of a special curriculum for the education of future engineers. 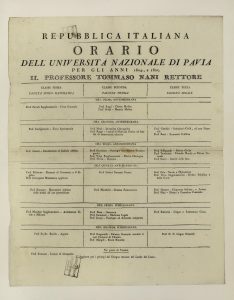 This is confirmed by the fact that in 1801 Luigi Forni, having passed the examinations of Physics, Mechanics, Agrimetry and Hydraulics “avanti il Rettore, il Decano e i Professori della Facoltà Filosofica” (“before the Rector, the Dean and the Professors of the Faculty of Philosophy”), was granted a diploma that proclaimed him “Engineer in the whole territory of the Cisalpine Republic”. In 1817 temporary norms for the various faculties were elaborated; in 1819 a letter from Rector Configliachi to the Government of Milan reported “il Regolamento definitive di disciplina e di studio per quelli che voglionsi dedicare alle utili liberali Professioni d’ingegnere, d’Architetto e d’Agrimensore” (“the final rules concerning the discipline as well as the studies for those willing to devote themselves to the useful liberal professions of Engineer, Architect and Land Surveyor“). In the same year the names of the existing courses were specified, i.e., Architecture (prof. Marchesi), Propaedeutic Calculus (prof. Lotteri), Sublime Calculus (prof. Brunacci, then prof. Bordoni), and finally Mechanics-Statics-Hydrodynamics-Hydraulics with notions of Applied Mathematics (prof. Gratognini). Four courses “di nuova istituzione e indispensabili” (“newly established and considered indispensable”) are added to the list: Descriptive Geometry, Static and Hydraulic Architecture, Hydrometry and Drawing. Yet, in 1825 since “… le provvisorie disposizioni impartite pel corso degl’ Ingegneri ed Agrimensori in Pavia sono insuffi-cienti, e non conformi agli studi filosofici..” (“the temporary measures taken for the courses for Engineers and Land Surveyors in Pavia have proved insufficient and inconsistent with philosophical studies”) a new scheme of regulations has then to be set down to become effective in 1827. Also the contents of the examinations are accurately defined: “Under the name of Sublime Mechanics are included all the mechanical sciences based on Sublime Calculus, i.e. Solid Statics and Dynamics, Machine Theory, Hydrostatics and Hydraulics. Descriptive Geometry is to be applied to the drawing of machines in particular. Geodesy, that is practical Geometry, will also include Leveling. As has always been the case, the course in Architecture is to be supplemented with the teaching of architectural surveys, house estimates and rights; to the course in Agronomy there will be added the teaching of land estimates and right. A teacher of Drawing will be specially appointed and under the supervision of the other professors will be in charge of training future Land surveyors together with 1st and 2nd year students of Engineering and Architecture in the elements of Ornate Drawing, and Topographic and Architectural Drawing; another 10-hour-a-week training will be given to 3rd year students in the skills of architectural composition“. At the end of this curriculum the student has to take three fundamental exams: (i) Pure Mathematics, Elementary as well as Sublime, (ii) Mechanical Physics and Agronomy, (iii) Geodesy and Architecture. After successfully completing the third examination the student had to stand a public “defence of thirty theses or more” in order to win the academic degree of “Doctor in Mathematics”. I Propaedeutics to Mathematics , i.e. Sublime Calculus, Rural Economy, with particular reference to the estimate of land products. Geodesy i.e. Land Techniques in all its parts and Hydrometry. Drawing with particular reference to geometrical aspects. II Sublime Mathematics with differential and integral calculuses. In 1840 for the whole Lombard-Venetian territory confirmation was given to the two “Istituti per I’istruzione dei periti Agrimensori, Ingegneri ed Architetti” (Institutes for the education of expert Land Surveyors, Engineers and Architects), one at Pavia University, the other at Padua University. The specific skills involved by the two professions were also accurately defined: “Engineers must be directly and concretely engaged in hydraulic constructions in general, but nevertheless be well trained in civil constructions… Finally architects must be trained in civil or rural constructions to a higher degree than engineers, particularly as far as architectural taste is concerned: for this reason architects will also have to attend the courses held at the Academy of Fine Arts“. In 1847 the Faculty of Mathematics was granted autonomy from the Faculty of Philosophy. In 1849 Antonio Bordoni presented a Proposal for a new curriculum of mathematical studies in which he hoped that practical courses in engineering would be organized and specializations in architecture as well as in rural, mechanical, mining, hydraulic and civil, military engineering would be provided for. Bordoni’s proposal was without issue, also because at that time the possibility of instituting polytechnical schools was being discussed. The only measure adopted was that in 1856 a few free courses were started: Science of Machine Construction, Mechanic Technology, Technical and Industrial Drawing. In 1859 Bordoni, now Director of the Faculty of Mathematics, resumed his former proposals emphasising the importance of further specializing the courses of Civil Engineering. Bordoni proposed that at the end of the four-year-course the examinations for the academic degree of “Doctor in the Studies of Civil Engineering and Architecture” should consist of two different tests. Two drawings, “one of a machine, and the other of a map” should be presented before taking the first exam. This one would concentrate on the subjects belonging to the first two years, while the second exam on those of the last two. Also in this case several drawings should be submitted beforehand “for a civil or rural architectural plan, and for a road and hydraulic architectural one”. The examiners’ board should be composed of the Head of the Faculty of Mathematics and the professors of the courses involved; the academic degree of “Dottore negli Studi d’Ingegnere e Architetto” (Doctor in the Studies of Engineering and Architecture) would be granted by the Rector of the University. In order to be qualified to practice the profession a three-year apprenticeship would be compulsorily required, the first year to be spent at the same University under the direction of two professors, while the others -under the direction of an Engineer practicing the profession”. After this training, a very severe examination should be taken “at any boards of Public Constructions”. Yet Bordoni’s proposal was dismissed and in fact in the same year 1859 the “Legge Casati” was issued promoting the institution of a practical school for engineers in Turin and a university-level technical school in Milan. Actually, with the Casati law Pavia was left at least the preliminary three-year course which was carried on till 1862; from then till 1916 only the first year survived. In later years Pavia’s school became a “Gabinetto e Scuola d’ornato d’Architettura” which inherited and then enlarged a library rich in art and technical works and was enriched with a valuable collection of plaster models. From 1865 to 1899 the chair of Ornate Drawing and Architecture was in the hands of Ferdinando Brusotti, physicist and engineer whose fame is linked to a patent for an incandescent electric lamp. In the 1920’s the Ornate Drawing School was regularly attended by approximately a hundred students who afterwards moved on to the Engineering High Institutes. Legally, the situation of the studies of engineering did not undergo any change during another forty-two years; nevertheless, all through this period a high attendancy and the importance and excellence of the teaching characterised the activities of the propaedeutic biennium, that is the preparatory course to the triennial practical course held in Milan or more distant cities, such as Genoa, Turin, etc. It is worth noticing that this two-year propaedeutic course has always been tied to the Faculty of Sciences of Pavia University as far as all the traditional subjects are concerned: obviously the contents have been evolving through the years in order to suit particular needs and in some cases since the beginnings there has always been a strict connection with specific engineering fields, e.g. rational mechanics. With the support of a wide public opinion, far-seeing firms and private citizens and also owing to the increasing number of students enrolling for the propaedeutic biennium, the opportunity of instituting a Faculty of Engineering began to be debated and the event took place officially on June 9, 1967. The Faculty of Engineering has effectively proved capable of satisfying the cultural demand of the district: in 1968 the course in Electrical Engineering was started to be soon followed by those in Electronic and Civil Engineering, and soon arriving to the present structure of the Faculty.